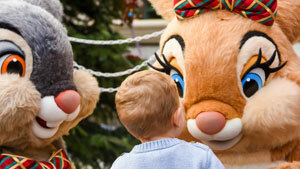 This Christmas, Disneyland Paris has everything you might expect from a Disney holiday celebration, and so much more. Crisp winter days lit up by shows, parades and seasonal atmosphere, warmed by all the favourite characters in their most festive garb and made truly enchanting come nightfall with a unique version of Disney Dreams! nighttime spectacular. Disney's Enchanted Christmas is without doubt one of the best times of the year to experience Disneyland Paris. The days might be shorter (and colder!) here in Marne-la-Vallée, but lavish decorations, Disney Characters and the biggest entertainment programme of the entire year make this the busiest time at the resort year after year and ensure the days are always merry and bright. It all begins with some turn-of-the-century charm as Main Street, U.S.A. goes all-out for the "holidays" with a truly giant Christmas Tree and frequest snow showers guaranteed. Throughout each day, unique festive character meet 'n' greets — and of course an encounter with Santa Claus himself — mix with wonderful festive shows such as this summer's returning guest favourite Frozen Sing-along, featuring Anna, Elsa and Olaf in a wintry interactive stage show. Disney's Enchanted Christmas will return from mid-November 2018 to early January 2019. Bookings are already open, with the best availability the earlier you book. Make this Christmas sparkle more than any before — there's still time to book a last minute Disney's Enchanted Christmas getaway with great value late deals. Christmas season now celebrates its very own parade with unique floats, costumes and an irresistibly joyous rhythm. For many years marked just by an extra float at the end of the regular daily parade, several years of smart investment have seen Christmas spawn its very own separate parade. Consisting six brilliantly decorated, bright floats with a plethora of characters and some of the best parade dance units and costumes of the year, this is not be missed — fantastic, then, that it happens twice daily! Even better, it's now also in addition to — rather than replacing — the regular Disney Magic on Parade!, so you get to see two top-quality Disney parades in one park. Santa Claus is comin' to town for the most magical Christmas Tree illumination you'll see this holiday season, hosted by Mickey Mouse. The Christmas Tree lighting ceremony has become a tradition at Disneyland Paris since its earliest years, going through numerous revisions and guises to this newly refreshed edition, likely to be considered one of the best yet. 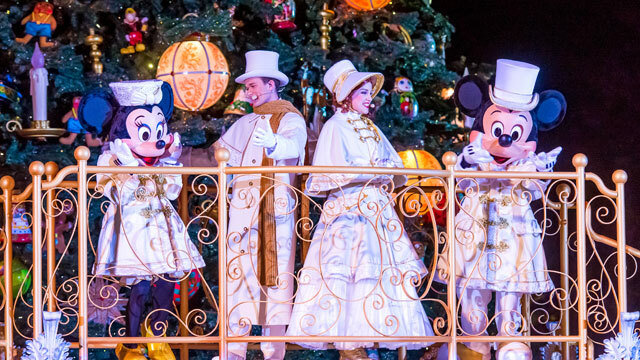 Simplified with just Mickey and Minnie appearing with several additional performers on a new elevated stage float in front of the tree, there's still time for a "Jingle Bells" sing-along before Santa Claus arrives and the magic of the tree lighting begins. First installed for the 2013 season, the new 24-metre high Christmas Tree is a wonder to behold — towering over the park, dotted with 1,000 beautiful ornaments and lit, in spectacular fashion as snow tumbles from overhead, by colour-changing LED lanterns. This is a popular event with limited space to get close to the stage, so arrive early. On very busy days, there may be two performances per evening! • One performance every evening at Town Square, Main Street, U.S.A.
A storm in the mountains threatens to disrupt Anna's surprise for Elsa at the Arendelle winter festival. Can you raise your singing voice to save the show? 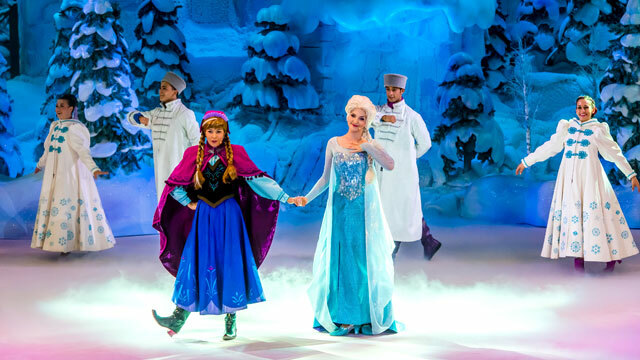 Fresh from its fully-expected success during this summer's Frozen Summer Fun season, Frozen Sing-along again provides the park's Christmas season with a stage show that has been sorely missing for several years. Though the set-up is simplistic and the interactive format might not suit everyone, it is nevertheless a well-produced spectacle that combines the best songs of the 2013 film with a chance to see its stars for real on stage. Children will be captivated for the entire 20 minutes — and by the final moments, as Elsa emerges from the beautiful snowy stage backdrop to flurries of snow and the hit "Let It Go", even the most frosty adult will be moved, too. See the magic of Disney's Enchanted Christmas with our YouTube playlist of shows, parades and atmosphere past and present. 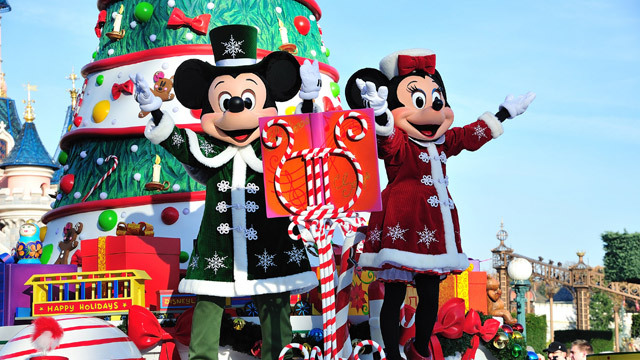 Special festival shows, parades, atmosphere and decorations throughout the parks and resort. Santa Claus makes a stop to visit Mickey Mouse at his backstage dressing room. Once you've seen Santa Claus in Disney's Christmas Parade and Mickey's Magical Christmas Lights, meet him for real and hand over your own Christmas wishes as he visits Meet Mickey Mouse. 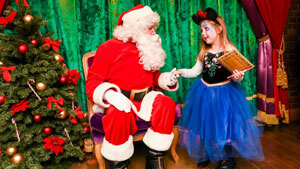 Throughout the day you'll be able to meet either Mickey Mouse or Santa Claus at this dedicated indoor location. Disney characters both familiar and unusual are waiting for memorable encounters, photos and autographs. Besides Mickey Mouse himself and childhood hero Winnie the Pooh, this Christmas offers a rare chance to meet some fluffy favourites: Thumper and Miss Bunny from Bambi and Marie from The Aristocats, each wearing with their own festive attire. Check the Park Programme before your visit and plan to arrive at least 15 minutes before most events, up to 30 minutes before major parades and shows on busy days. Snow falls at regular intervals throughout the day on Main Street, U.S.A. but also during certain entertainment. This is one time of year you must watch the parade here! Browsing the resort's boutiques is a great way to stay warm between attractions. Try New Century Notions on Main Street, U.S.A. and Walt Disney Studios Store on Front Lot for this year's Christmas-themed gifts and decorations. Stop off at Starbucks Coffee in Disney Village for their famous seasonal hot drinks in red cups. At the end of a tiring day out in the fresh winter air, warm up in front of the open fire at Redwood Bar and Lounge in Disney's Sequoia Lodge. 2 Parks for 1Get 2 parks for the price of 1 with this special Christmas park ticket offer! 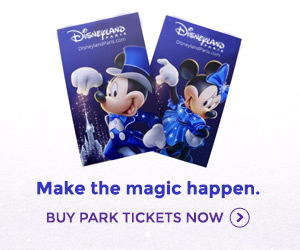 It's not too late!Hotel and park ticket packages are still available to make 2016 magical. Book Now for 2017Bookings are open for the next Disney's Enchanted Christmas!